I know I don’t know much about football, but I know what I see. Discipline, Teamwork and Common Goal. That’s what I see in a good game of football. And what do I mean by a “good game”? I mean a game played by a real team as opposed to a disparate and desperate group of individuals. How would I define Discipline? Practice, practice, practice. The kind of practice that amounts to what Malcolm Gladwell calls “The 10,000 Hour Rule“. The kind of practice that makes your head and body ache all over but you still continue to strive because you know the prize outweighs the cost. How would I define Teamwork? When everyone on the team sets aside their ego to get the job done. And not just done, but done well. So well that it makes you swell with pride. Great teamwork means working hard when people are together and when they are apart. A winning football team doesn’t just wait to play together for the several weeks in the runup before the cup (that’s far too late to be learning how to play together and still expect to win the World Cup). They create opportunities to get team practice in. And, of course, everyone learns. From each other. For the team. Even if that means exposing one’s weaknesses and our own lack of knowledge, skills and experience. How would I define Common Goal? One that everyone in the team truly believes in. One that inspires each individual to be the best they can be so that, together, they can become more than the sum of their parts. And there’ll be lots of passing of the ball, like the way Xavi plays, because there is no single star or hero in a winning team. The brilliance lies in the team playing to each other’s strengths and strengthening individual weaknesses. The gleam comes from the team achieving the Common Goal together. What do you do after you’ve won the World Cup? Will you tie up your laces and hang up your boots? Will that be it? Of course not. I know I don’t know much about football, but I know what life shows me about winners and losers. Winners carry on winning, moving the goal posts further out with each win, like Armstrong and Ferrera, winning not just once, but many times because the goal is much more than just the space between the posts. Winners turn their expertise into repeatable formulae, achieving “conscious competence of unconscious competence“, so that they become better than they were yesterday every day. And true winners help others become winners, too. The Yellow Brick Road – Version française now available! Ouais! L’édition française de La Route de Brique Jaune est arrivéé finalement. 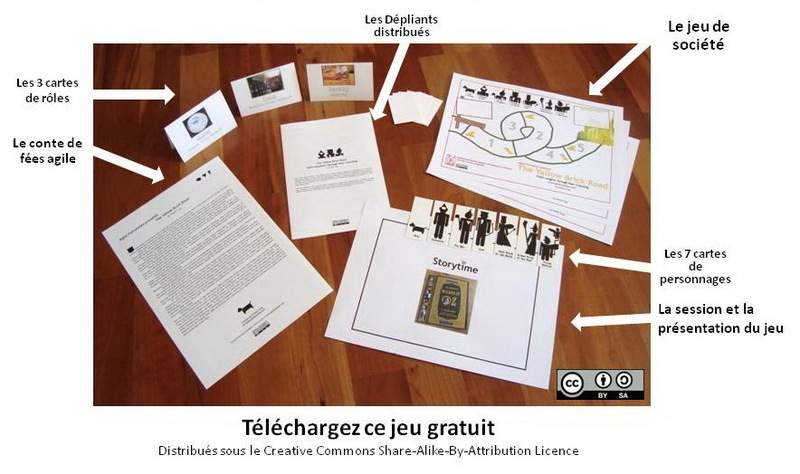 Visitez www.agilefairytales.com et téléchargéz ce jeu gratuit. Dépensez des minutes de merveilles avec votre équipe et vos amies pour apprendre comment faire le co-coaching (le ‘peer coaching’ en anglais). A bientôt! You are currently browsing the Selfish Programming archives for July, 2010.